If you enjoy watching Sky at home in the UK, you may not realize that you can also watch your favorite channels through other devices, including an XBox console, laptop, tablet or smartphone. The ability to get Sky over the internet means that whenever you are close to a WiFi hotspot, such as on public transport or in a café, you can also watch from there. However, if you have tried to access the service from abroad, you have probably run into problems. Sky is only allowed to show its programs within the UK and the Republic of Ireland, so it actively blocks access from other countries. Thankfully there is a way around this block – use a Virtual Private Network (VPN). If you get Sky with a dish, or as part of a cable package, you are also able to access the service over the internet for free. You can channel your Sky package through two separate devices simultaneously with Sky Go, as well as having the service switched on through your set-top box. Sky Go is free of charge, but you have to already subscribe to Sky at your home in order to use the service. You can only get the same channels that you have in your subscription package and you need to have access to the internet in order to use Sky Go. If you don’t have a Sky subscription, you should check out Now TV, which is the same as Sky Go, but you don’t need to have the Sky service at home to access it. You might be able to access the Sky Go site, but that doesn’t mean you can automatically watch shows on it. You first need to set up a Sky ID, which is like a username for the site. Fill out your details on the website. Next, you will receive an email containing a verification button. Press the button in order to confirm your email address. 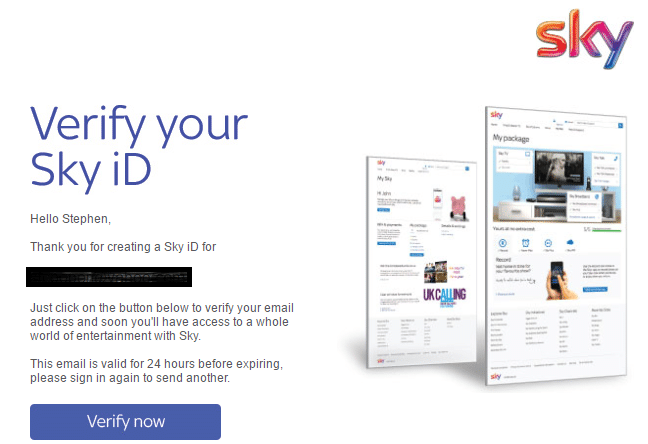 Next, you have to associate your Sky ID with your Sky service account number. This task is relatively simple and you should find all the information you need to complete the sign up process if you have a Sky invoice to hand. If you don’t already have a home TV package from Sky, you can sign up online. 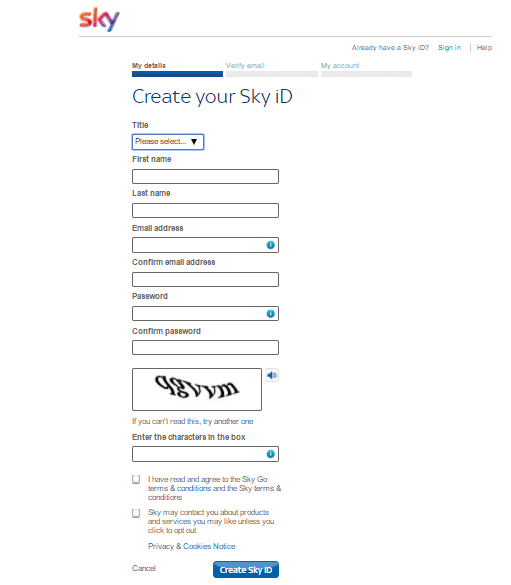 However, if you only want to access Sky over the internet, you would be better off signing up for Now TV. The fact that Sky Go is free, and you can watch it on two devices at once (in addition to the service through the set-top box), gives you an opportunity to watch Sky TV without paying. Ask your friends and family whether any of them have a Sky subscription. If you find someone who has the service, but isn’t interested in accessing it over the internet, then get their account details and use that to set up a Sky Go account for yourself. You have to register the device that you watch Sky on and you can only change your registered devices once a month. When you download the player app and log in to it, the program will register your device automatically. If you want to watch through a browser on your Windows laptop, the computer you are on will automatically be registered the first time you play a video on the Sky Go site. Therefore, be careful about watching Sky Go on a friend’s device, because that will use up one of your allowance of two devices and you can’t register a different one until the following month. What Devices Can I use Skygo on? You can watch Sky Go on tablets and smartphones that run the iPhone iOS or Android operating system. On laptops, the Sky Go service really only works properly with Internet Explorer 11 and above. There is no version for Firefox. If you use the Chrome browser, you will need to install a plug-in called Microsoft Silverlight. This program is free, but many Chrome browser users report that the Chrome version of the Sky Go player doesn’t work properly. For Mac OS, phones and tablets, you need to download a player app in order to watch Sky Go. All of the required software is available at the Sky Go site. If you have a monthly subscription and you want to continue watching Sky Go when on holiday, or if you want to help your mum watch Sky from her retirement home in Spain, then you are going to hit a problem. Sky won’t let you watch Sky Go from outside the UK or the Republic of Ireland. This situation is common with video streaming services, particularly those that are associated with TV channels. This is because the station only has a license to operate in the UK. This problem doesn’t just arise because of the company’s legal obligations to the UK government, but also because of the agreements it signs with TV production companies. For example, Sky pays the producers of Game of Thrones for the rights to show that series in the UK. Different companies pay for the right to show that program in other countries. Thus, if Sky let you watch Game of Thrones in Spain, it would be contravening its agreement with HBO, which owns the rights to the program. Also, the company that bought the right to show that program in Spain would be angry with HBO for not enforcing those privileges. How Do Regional Restrictions Work? In order to avoid legal action, Sky prevents people from accessing its shows with Sky Go from abroad. It is able to enforce this rule because every message that travels across the internet has a source address on it. This is called an Internet Protocol (IP) address. The Sky Go server has to know where to send the content to, so it reads that address. Like a telephone number, every IP address has a country code on the front of it, so if the server gets a request for a show from a foreign address, it simply refuses to send the content. Instead, you will receive an error message telling you that the programs on Sky Go are not available in your location. 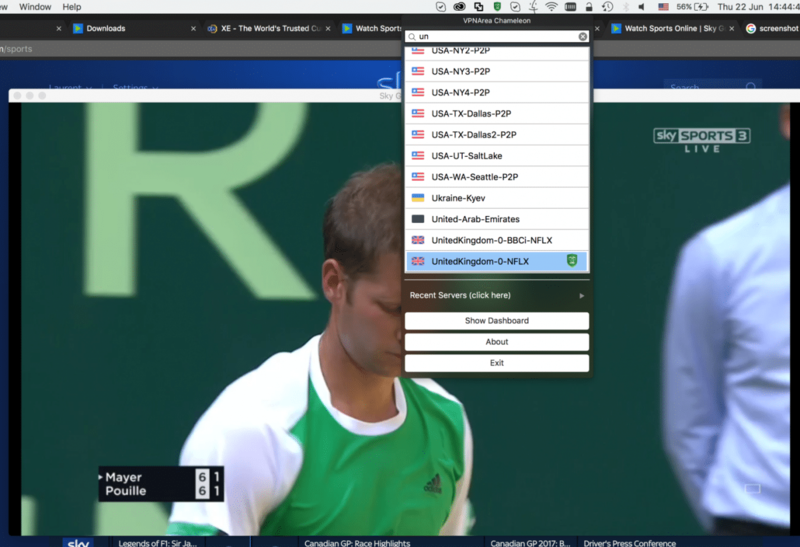 The simple way to get around the regional restrictions at Sky Go is to get a program that will change your IP address to make it look like you are in the UK. If you can fool the server into thinking that the request comes from the British Isles, it will send you the video content and not the error message. However, there is no point just substituting any old IP address for the one that your computer is really using, because you need the video to come back to you, not to be sent off to some fantasy address. VPNs help people get around regional restrictions by fooling the servers of sites such as Sky Go. Virtual Private Network (VPN) technology was invented to mask the source and destination of each internet message and thus create the same level of privacy that private networks enjoy. A VPN encrypts the entire data packet, including the header with its address information. As routers need this header data in order to send packets to their destination, the VPN carries that entirely encrypted packet in an outer packet, which is addressed to its own server. When a packet arrives at the VPN server, it strips off the outer packet and decrypts the original message. The VPN server then sends the packet on to its intended destination, but puts its own address in the header for the origin of the message. When your browser sends a request to the Sky Go server for a video, that request will arrive with the VPN server’s address on it as the source IP address. If you routed your request through a VPN server in the UK, the Sky Go server will send the requested content back to that computer. The VPN server will then encrypt each segment of the video and place it in a packet that is addressed to your computer. You need to have VPN client software installed on your computer in order to use one of these masking services. Also, you will probably need to pay a subscription fee. Although there are a number of free VPNs available, these usually aren’t good enough to get around media players’ regional restrictions. Unfortunately, many media streaming sites are aware that people use VPNs to bypass their regional restrictions. Many sites put in extra effort to detect the use of VPNs and block them. Sky Go has some of the most thorough VPN detection procedures in the business, and many VPNs just can’t get you in. If you using a VPN’s free trial or money-back guarantee period, be sure to test the system to ensure that you can get all the way through the Sky Go site to actually watch a show. The VPN detection system doesn’t kick in until the point where a selected show is about to play. The Sky Go VPN detection system records the IP addresses of those attempting to bypass the site’s regional restrictions. The Chinese authorities also use this method as part of their attempts to control access to certain websites within their borders. VPNs use shared IP addresses. That means that if someone accessed Sky Go with an IP address and the VPN was detected, the address will go on the blacklist. Once that user disconnects from the VPN, that IP address goes back into the pool for use by another customer. VPN detection systems realize that VPNs own thousands of IP addresses and that they usually buy those addresses in blocks. Thus, if one IP address is associated with a VPN, the detection system will blacklist a whole range of addresses. You stand a better chance of getting into Sky Go if you choose a VPN that works with Netflix. Netflix operates in many more countries than Sky, and so some VPN companies put extra effort into beating the Netflix proxy detection system in order to win more customers. One strategy that VPNs use in order to get around the regional restrictions of Netflix and Sky Go is to buy IP addresses individually, rather than in blocks, and also to dump and replace IP addresses once media servers detect and register them. The management of IP addresses is an expensive and time-consuming task, so most free VPNs don’t bother to try to keep ahead of media company blacklists. Many successful VPNs create specific servers to get into media sites. As Netflix is the touchstone for the industry, you may see servers in the available location options for your VPN that include the word “Netflix” in them. Generally, these servers are the most likely to get you into Sky Go. For this review, I used VPN Area to get around the Sky Go VPN restrictions. The company can get into Netflix UK and is also able to skirt restrictions in China, which marked VPN Area out as a good bet for Sky Go. The company has a long list of servers. However, when you access a media site, you need to access through a VPN server that is in the same country as the target streaming service – in this case, in the UK. VPN Area has nine servers in the UK and two of these are specifically tailored towards Netflix. If your VPN isn’t getting you around the Sky Go proxy detection system, try switching to a different server in the UK. In this case, using VPN Area’s United-Kingdom-0-NFLX server got me into Sky Go from the Caribbean. You can trick the regional restrictions of Sky Go to watch it from outside the UK if you use a VPN. However, not all VPNs can get through the Sky VPN detection system. If you are having difficulties getting into Sky Go with your VPN, disconnect from the VPN and reconnect, so you will get a different IP address. If that doesn’t work, try selecting a different UK server in the VPN app. Make the most of free trials and money-back periods to test out your VPN thoroughly. Make sure that your chosen VPN can get you through the Sky Go controls and enable you to watch a video. Not all VPNs are equal. However, if you find the right VPN, you can easily watch Sky Go from outside the UK.